It’s official, the BMW Z4 ended production last week. It’s sad when a good car like the Z4 is put out to pasture. The Z4 and its Z3 predecessor have served (with honor) BMW’s faithful for the last 20 years. Though there were hardtop coupe and high-performance “M” versions along the way, the bread-and-butter version has always the roadster. It’s been a popular car in BMW’s line-up. The upcoming Z5 when it hits production is going to have some mighty big shoes to fill. If it had not been for the smash success of the 1990 Mazda Miata, there would have never been the original release of the 1996 Z3. The Z3 began its production run as a Miata competitor. BMW took the Miata concept and added BMW styling, performance, and handling. Though the Z3 roadster and coupe M versions were road rockets, once the newness wore off, the M was dropped when the 2003 Z4 debuted. BMW could have easily crammed a V8 under the hood or created a super-performance M version of the Z4. It would have been the stuff legends are made of – visualize the 1998-2003 BMW M5’s (394 horsepower) 4.9 liter V8 and 6-speed manual transmission being dropped into the 2003 Z4, and you get the idea. The entire package wouldn’t have weighed more than 3,100-lbs and would have ate most the world’s fastest 2-seaters for breakfast including the Chevrolet Corvette. But that just wasn’t in the cards. Though BMW has made a name for itself in the last 3 decades with its high-performance M versions of its cars, in reality that’s a tiny slice of its business. Its core business is providing the masses with good European touring cars. A touring car isn’t about going down a road as fast as possible, it’s about perfect balance. A BMW M version is like a large body-builder who may be in good shape and can lift massive amounts of weight however all those muscles come at a cost – loss of agility and speed. A 260-lb bodybuilder isn’t going to be as agile or quick as a 150-lb athlete. The athlete will have firm toned muscles but won’t be as strong as the bodybuilder. The BMW M cars are like the bodybuilder, they have tons of muscle under the hood giving phenomenal performance. Handling and braking are also phenomenal in order to keep up with the great power under the hood. This comes at a cost – gas consumption is very high and day-to-day driving can be torture due to a harsh suspension (that’s tuned for an ultra smooth race-track surface and not the normal pothole populated streets). Whereas the rank-and-file BMW car is like the athlete, it has the perfect balance – good acceleration, good braking and handling, and a ride quality that will absorb the worst road imperfections. In other words this is the type of car that will be enjoyable in all driving conditions, while the M will be more fun but only when the driving conditions are ideal such as a nice smooth road with no traffic. With all this in mind, you can understand why BMW just let the Z4 be a good touring car instead of the high-strung ultra-fast sports car it could have been. Being a touring car is the role that the Z4 performs so well. The Z4 may still been considered a Miata competitor, but in reality it’s in a league of its own. Though the Miata has become more civilized over the years, it’s harsh, underpowered, and lacking in social graces compared to the Z4. For instance the current 2016 Z4’s interior though it has been around for few years, it still is far superior to the all-new 2016 Miata’s interior. The upscale materials and overall design of the Z4’s interior makes the Miata look like Mazda cut some corners with the Miata’s interior. Not really a surprise since the 2016 Z4 has a $49,700 base price compared to the 2016 Miata’s base price of $24,915. In other words you can buy two Miatas for the price of one Z4. Is the Z4 still worth the price, you bet! 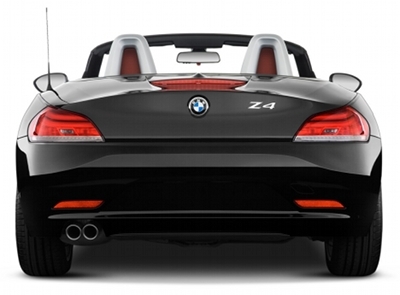 There’s more to the Z4 than its ultra comfortable interior and plentiful high-tech gadgets and gizmos. The fit and finish of the entire car is par excellence. All the body panels have perfect fit just like the interior panels. Even closing or opening a door or the trunk is pure perfection. It’s what we have all come to expect from BMW, and it’s the reason for the high admission price. When you are buying a BMW, you aren’t buying a car, you’re joining a club that a majority of car buyers will never be a member. The Z4’s exterior styling is unique, even those who aren’t car folk won’t confuse this car for anything other than a BMW. It’s nice on the eyes but not super spectacular. It’s not going to ever be in any automobile historian’s top 10 best sports car exterior designs, but it’s pretty enough to turn heads. The current body style was introduced for the 2009 model year, it has aged well. BMW did it right starting in 2009, instead of offering both a roadster and a hardtop coupe version, it offered just a roadster with a retractable hardtop. This pleased the hardtop crowd or those who live in cold winter climates, yet kept happy the open air convertible fans who are the Z4’s core buying constituency. 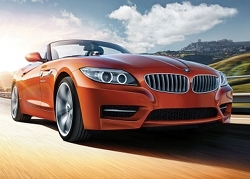 With the Z4, BMW offers some really lively exterior colors. If you want to buy a Z4, don’t fall into the silver, black, and white exterior color crowd. There’s a sea of new BMWs driving around with these colors. Be a little bold and opt for Valencia Orange, Melbourne Red, or Estoril Blue, it will make your Z4 really stand out and prove to those other BMW owners you have some flair. For a toned-down alternative, Sparkling Brown is a classy color that’s sure to get you some thumbs up from onlookers. As previously mentioned the Z4’s handling, cornering, and acceleration are well-balanced. This car will never let the driver feel shorthanded. The base engine is a 240 horsepower and 260 lb-ft of torque twin-turbo 2.0 liter 4-cylinder. The mere thought of a small-displacement 4-banger propelling a pricey performance-oriented 2-seater doesn’t sit well. Kind of like the thought of ordering an In-N-Out double burger only to discover it’s the size of M&M when the order is ready to eat. Somehow BMW has pulled a rabbit out the hat, and the tiny-4 makes more than enough grunt to move the 3,263-lb car with ease – 0-60 mph in 5.6 seconds. If zippy power isn’t your cup of tea, you’ll at least be elated by the 2.0 liter 4’s EPA rating of 22 City MPG and 34 Highway MPG which will have you reaching into your wallet less often. 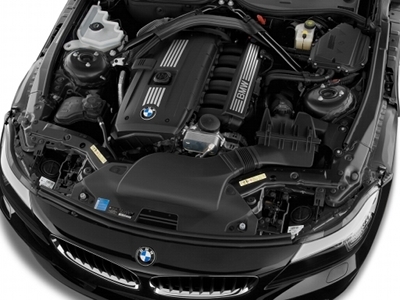 To get the 2.0 liter 4 is the mandatory engine with the base Z4 which BMW calls the “Z4 sDrive28i”. This motor for no additional cost can be equipped with either a manual or automatic transmission. mandatory 300 horsepower twin-turbo 3.0 liter I6 which offers a nice 60 horsepower bump over the standard engine. This equates to 0-60 mph in 5.0 seconds. The next upgrade is to Z4 sDrive35is which adds even more standard features and the 335 horsepower version of the turbo 3.0 liter I6. With this upgrade, the Z4’s 0-60 mph time drops to 4.8 seconds and yields a 165 mph top speed. However it’s costly, the sDrive35is starts at $67,345. Though a high-performance M version of the Z has been gone for over a decade. Its spirit isn’t gone, BMW offers a “M Sport package” with all Z4 trim levels. This package includes an aerodynamic kit, a sport steering wheel, and other interior trim enhancements. The package may not increase performance but it does add some nice touches to an already beautiful car. BMW has been hush on many of the details of the upcoming Z5. What we do know is that the Z5 will be built on a new joint venture BMW and Toyota platform. In other words the BMW Z5 will share its platform and possibly other components with a newer version of the Toyota GT86. The exact same type of venture Subaru had with Toyota to develop a shared platform for the current Subaru BRZ, Scion FR-S, and Toyota GT86. These are the type of joint ventures that make Sergio Marchionne giddy. In reality, it’s this type of pennywise but pound foolish thinking that leads to an eventually downgrading of a great brand name. Toyota is a fine brand, but its GT86 sells for a lot less than the Z4. This partnership will elevate Toyota’s sports car credentials, but will hurt BMW. Put another way it’s going to be a hard sell to convince even the most loyal BMW buyer to purchase a $50,000-$70,000 Z5 which is built on the same platform as a $30,000 GT86. Good luck BMW, you’re going to need it! There are many in BMW circles disappointed that BMW hasn’t made a big celebration of the passing of the Z4. It’s a flawed trait that most automakers possess, when a car no longer serves a purpose it’s thrown out to pasture without even an informal goodbye. Only after many years have passed after the departure, do automakers start recognizing a long gone model with nostalgia, and so do the collectors. Make no bones about it, this day will come for the Z4. It may be 25 years from now, maybe a little sooner or perhaps later, but the Z4 will eventually be recognized for what a great 2-seat touring car it is. When that day comes the collectors will start swooping them up in droves, driving the prices through the roof. If you like to own this future BMW classic now, you’re in luck, brand new examples are still on BMW dealer lots waiting for a good home. At least this is the case until the end of the year, by that time a majority of them will be gone. If you should decide to take the plunge, make sure you get a good discount. Most BMW buyers are focused on the upcoming Z5, so interest in the Z4 is at a low point. BMW dealers are very motivated to move them off their lots to make room for the new 2017 BMW models. If you purchase one the reward is not just the good deal you’ll get, but driving the last BMW Z car that was 100% BMW in DNA. Years down the road this will mean a lot to collectors. For Z4 buyers the purchase is an investment in the fun they will have over the next 25 years before Z4 nostalgia kicks into high gear.